In Hungary, average gross and net monthly earnings increased by 13% year-on-year in November. The reading was a slight upside surprise, with market expectations spread in a narrow range of 11.3% to 12.6%. Wages increased by 17.5% YoY in the public sector mainly due to the 50% YoY growth of one-month bonuses. The wage increase was less robust in the private sector, rising by 11.2% YoY. 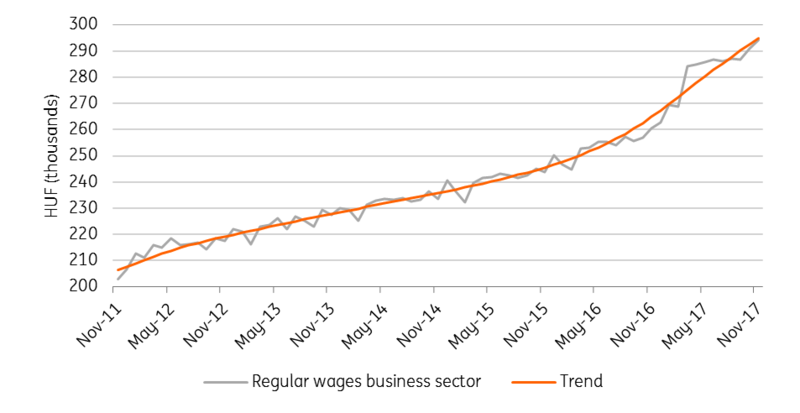 Labour shortages and wage settlements are still the main factors behind the growth in wages, along with the rise in minimum wages. The number of workers in the primary labour market increased by 79k YoY while the number of fostered workers--low-paid workers in a programme set up by the government--dropped by 48k YoY to 152k. In 2017 overall, we expect double-digit real wage growth due to the 13% wage increase and the 2.4% headline inflation rate.